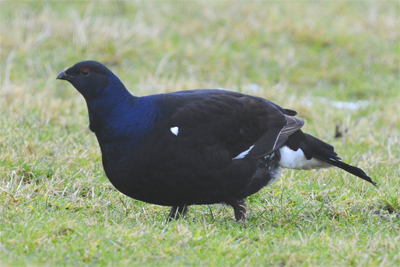 With Spring drawing ever closer, and our North Pennines Safaris starting in just over a month, we decided to spend Sunday checking all of our regular Black Grouse sites. 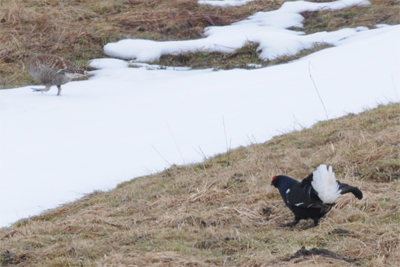 Although the winter may have been expected to do some real damage to the population, we managed to find 24 Blackcocks and 9 Greyhens, split between 4 sites. Birdwatching in the North Pennines, whether in Northumberland, County Durham or Cumbria, is always a pleasure and accompanied by a sense of wilderness. 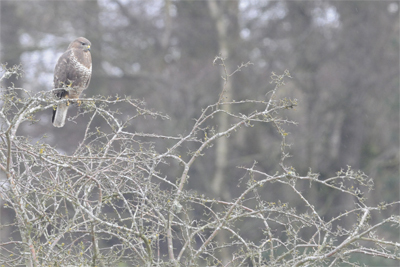 A Common Buzzard perched by the roadside allowed just a second to capture this image before it was off and away over the trees. On the way to Upper Teesdale we found a ‘new’ site for Black Grouse, one which should, with patience, produce some excellent photo opportunities. Across at a traditional lek site, one enthusiastic male was letting fly all on his own, while 7 Greyhens watched him, presumably with a mixture of boredom and pity. I told you already, I'm not interested. As the weather deteriorated and visibility decreased, we stopped to check another site which has held 3 or 4 birds in the last couple of years. As we drove along the road a Blackcock flew across in front of us and vanished behind a drystone wall. We approached slowly, and incredibly there were no less than 8 2nd year Blackcocks, all feeding quietly within a few metres of us. The lack of sunlight detracts from the image, but it’s an addition to our Blackgame photography locations. 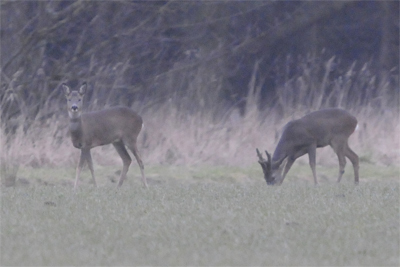 As the rain intensified, we spotted a pair of Roe Deer in a field near Cramlington. Venturing into the realms of ISO 3200 allowed a record shot before we returned home.